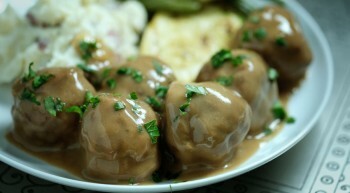 Vanee Swedish Style Sauce is a traditional sauce made with a combination of a rich beef gravy and sour cream. 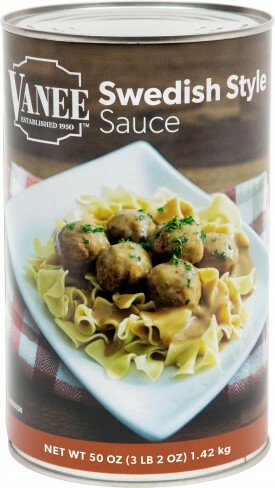 A unique item on the marketplace, Vanee Swedish Style Sauce is the perfect accompaniment for meatballs, and is shelf-stable, gluten free, and has no high fructose corn syrup. Each 52 oz. can has 21 quarter-cup servings, for a total of 288 servings per case. Serve over meatballs, pasta, or pasta with meatballs. Water, Sour Cream [Cultured Cream, Stabilizers (May Contain Food Starch-Modified, Guar Gum, Locust Bean Gum, Carrageenan, and/or Pectin), Sodium Citrate, and Potassium Sorbate], Food Starch - Modified, Beef, Enriched Wheat Flour (Wheat Flour, Niacin, Reduced Iron, Thiamine Mononitrate, Riboflavin, and Folic Acid), Salt, Onion Powder, Sugar, Buttermilk Flavor (Buttermilk, Butter Oil, Lactic Acid, Natural Flavor, Nonfat Milk, Disodium Phosphate, Enzymes, Mixed Tocopherols), Caramel Color, Yeast Extract, Maltodextrin, Soybean Oil, Flavoring (Contains Canola Oil), Beef Stock Powder, Disodium Inosinate, Disodium Guanylate, Lactic Acid, Calcium Lactate, Grill Flavor (Contains Sunflower Oil).